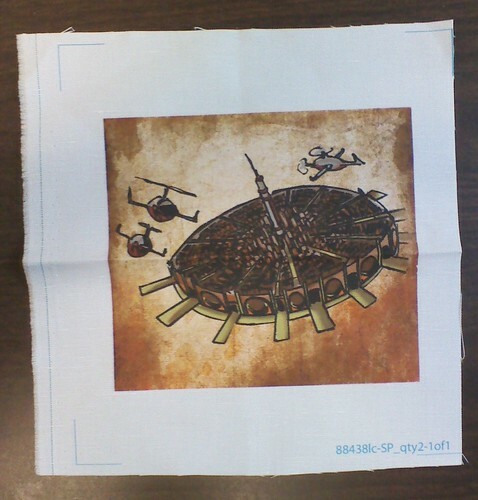 This patch, featuring the fantastic artwork of Steve Walker and Natalie Kelly, will perhaps be the first in a series of Flying City-themed patches, thus making it easy for the average clouddog to steampunk-up their wardrobe. The print quality and fabric is super-nice. Now that we know that we CAN make these patches, the question becomes if we SHOULD. I would like to say that I’d buy a patch, but in all honesty, I don’t think I can promise to buy one. I’d probably have to buy three or four. I do. now. make. it. happen. We’re looking into it. Both Steve and I really want these patches to happen, so I imagine having them available is a real possibility. The question is do we do printed patches like these, with complex art? Or simpler, embroidered patches? I’d suggest embroidered patches if they were 3″ or smaller. If you do the complex art at that size things will be muddy. Though if you have it as a large patch that would say, be sewn across the back of a jacket, that would be cool. Forgive me if you know the stuff about sizing and complex art already, it’s the designer in me coming out. We’re thinking about 3″ for the patches, but with simpler, more graphic art.